038 :: MULTI-TASKING IS A MYTH. DO MORE BY DOING LESS AT ONCE. Time is divided not multiplied when you attempt to do more than one thing at a time. 037 :: NAME FOLDERS & FILES FOR COMPREHENSION BY ANYONE. Names should make sense to a new person on their first day. 036 :: COMMUNICATION CLEARS UP THE MORE SENSES YOU INVOLVE. 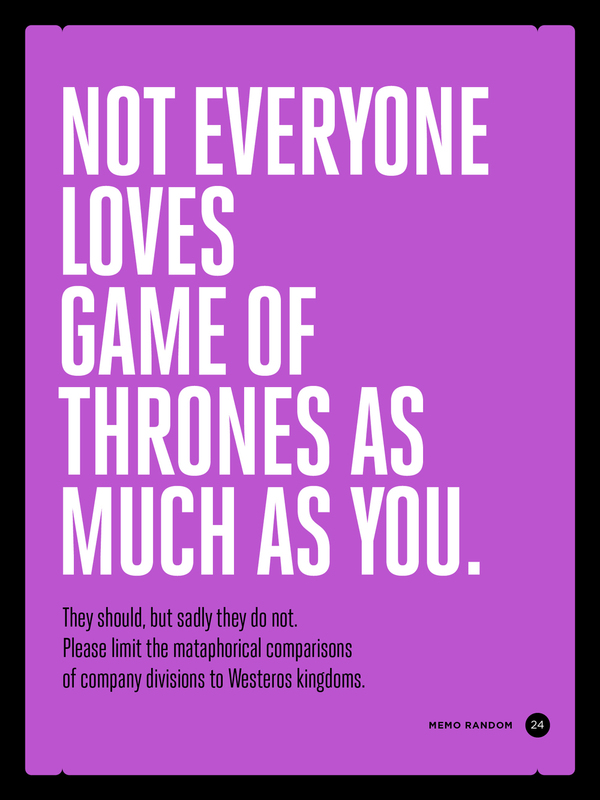 Texts and emails are sight only. Video chats add sound. In-person adds touch. 035 :: ALWAYS ERASE THE WHITEBOARD WHEN FINISHED. The whiteboard is a temporary surface for your ideas. Take them with you and make them real. 034 :: ALL REQUESTS REQUIRE A TIME FRAME FOR COMPLETION. WHEN you want something is just as important as WHAT you need. Be clear in your requests. Need I say more? Beligian-freakin-Cowboys! 033 :: THE TIME WHEN A MEETING IS SCHEDULED IS WHEN IT STARTS. If you need to setup your laptop or load your presentation – do it BEFORE the meeting starts. 032 :: CLEAR QUESTIONS ARE THE SHORTEST PATH TO CLEAR ANSWERS. Summarize yourself. Ask questions that can receive a yes or no answer. 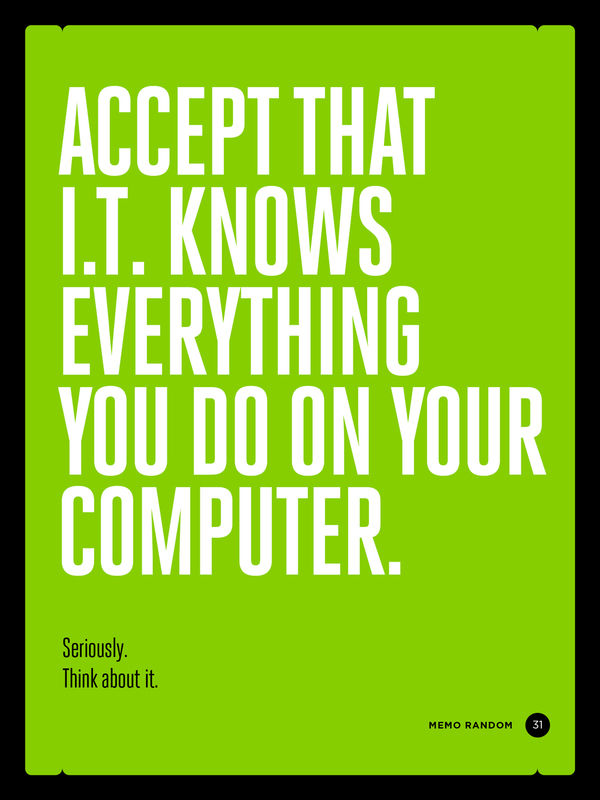 031 :: ACCEPT THAT I.T. KNOWS EVERYTHING YOU DO ON YOUR COMPUTER. 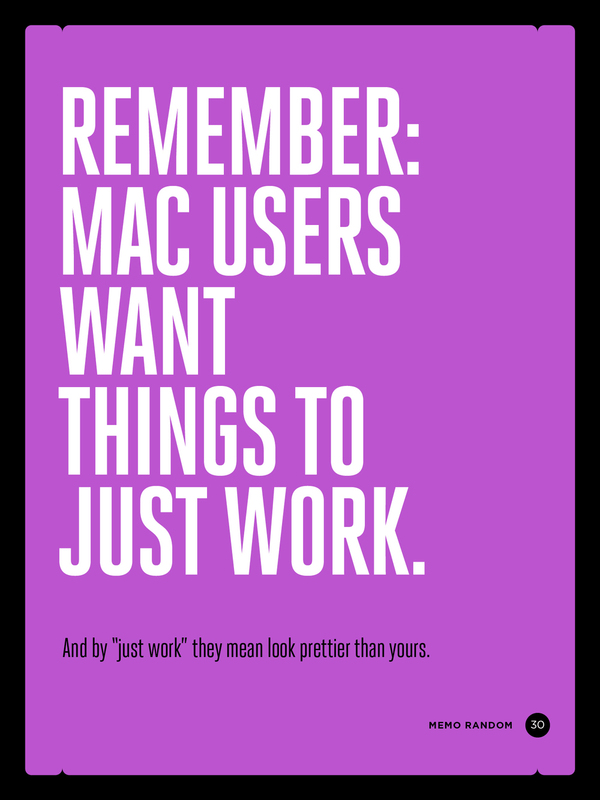 030 :: REMEMBER: MAC USERS WANT THINGS TO JUST WORK. And by "just work" they mean look prettier than yours. 029 :: FILING EVERYTHING ON THE DESKTOP IS FILING NOTHING. You don't leave your clothes in a pile on the floor, why leave your Sales Reports there? 300% FUNDED IN 9 DAYS! 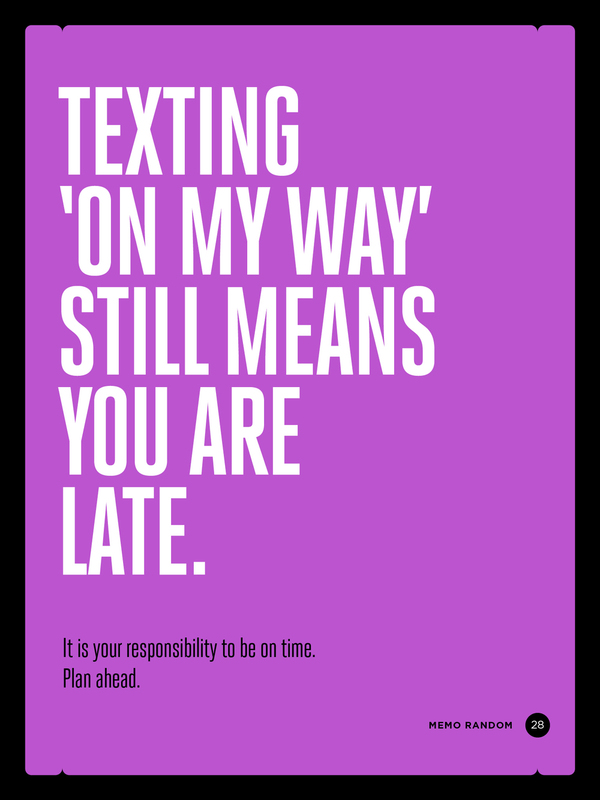 028 :: TEXTING 'ON MY WAY' STILL MEANS YOU ARE LATE. It is your responsibility to be on time. Plan ahead. 027 :: REMEMBER: WINDOWS USERS HAVE DREAMS, TOO. Don;t let an operating system come between co-worker, departments or progress. People control machines, not the other way around. 026 :: THE MORE PEOPLE YOU INCLUDE, THE LESS WILL GET DONE. Only invite essential people to your meeting. Everyone else will thank you. 025 :: IT IS YOUR RESPONSIBILITY TO KEEP YOUR SOFTWARE UP-TO-DATE. No group chat because you're running Skype 1.0? Get with the programs. MEMOs are a Kickstarter Staff Pick! They like us - they really like us! Kickstarter added Memo Randoms to their Staff PIcks - showing their excellent taste and support for our mission to change the world one MEMO at a time. 023 :: ON A SPEAKERPHONE, IDENTIFY YOURSELF WHEN YOU SPEAK. Quality of Connection / Quantity of Participants = Who said that?